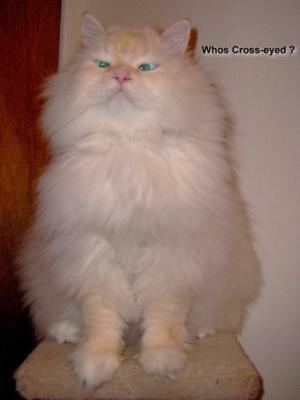 Daniel is a beautiful 3yr old Flame point Himalayian persian . He has a tendancy to look down his nose at you when he's trying to figure something out , and then proceeds to go crosseyed ! . I managed to capture this hilarious picture of him doing just that while trying to photogrpah him .. The most handsome of cats!!! An award winning picture for sure! soooooo funny and very cute !